MarkingApp is a questionable program, to say the least. Malware experts have dubbed this application as an adware due to its invasive functionality. If you have discovered MarkingApp active on your operating system, do not hesitate and remove it as it holds no beneficial features whatsoever. On its official website, this adware program is marketed as a great tool to enhance your online searching experience, which might sound tempting, but in reality, these statements are just a marketing gimmick used to lure unsuspecting users into downloading and installing a program that is utterly useless. Do not get fooled by these promises as you could end up with an extremely annoying and invasive program on your PC. We have crafted a detailed removal guide that will help you remove MarkingApp in no time. Since it is impossible to download MarkingApp from its official website, it is quite natural that this adware program is distributed in some other suspicious way. It is not surprising that during the research we have discovered that in most cases MarkingApp is spread via software bundles. Often bundled installers are up for download on suspicious third-party download websites or websites associated with online privacy. Avoid such web pages at all times because it will significantly reduce the risk of getting your PC infected with other various Internet-based infections. Also, make sure to implement a reliable antimalware tool, which would provide system security at all time. MarkingApp is extremely invasive because as soon as it gains access to your PC it will flood your web browser with numerous third-party commercial ads and annoying pop-ups. These ads and pop-ups will make your life miserable as you will be forced to fight through them every single time you browse the web. Instead of providing help, MarkingApp will provide ads that are in fact utterly worthless and should not be trusted because they will in no way help you shop online in an easier way. 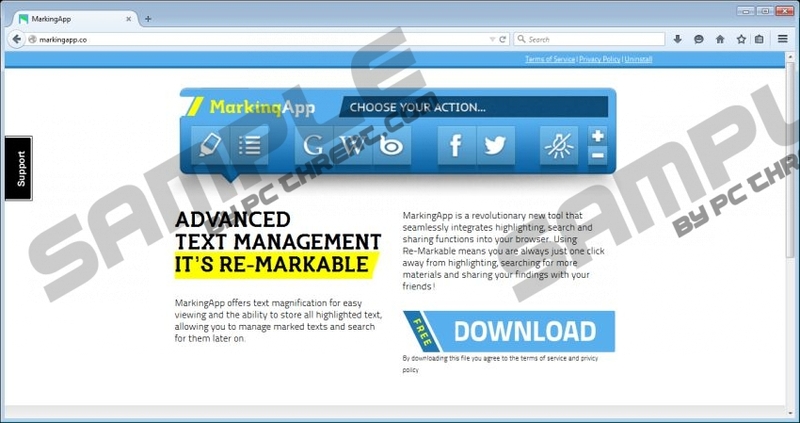 If you wish to regain the standard functionality of your web browser you need to conduct the complete removal of MarkingApp as soon as possible. Use the detailed removal guide provided below to do so. The removal procedure of MarkingApp is rather simple because you can delete this adware program via Control Panel and that will stop the annoying activity. Keep in mind that, even though, the annoying activity has been stopped some traces of MarkingApp could still be active on your PC. This is the reason you are advised to scan your PC with a reliable antimalware tool, once you have executed the manual removal. Right-click MarkingApp and then select Uninstall. Move the mouse cursor to the lower-left corner of your dekstop. Select MarkingApp and then click the Uninstall button. Quick & tested solution for MarkingApp removal.